12z Euro spits out around .25qpf for Chitown and even more over S MI peeps. What a turn of events! It’s even showing a Lehs signature. You're sitting in a sweet spot with likely help from the Lake.. This is like a gift from nature...I’m going to be filled with joy waking up on Christmas with a couple inches of powda! Makes up for the wiff of the Solstice storm. ....that snow cover map is a little misleading....nothing here. Being without any measureable snow for the month of December is really strange so seeing the new model runs is a nice surprise or dare I say "Christmas Miracle"
I'll take the 2" that the Euro is showing from this. Same but the low end being 2" is definitely not a bad sign. I'm looking at brown grass in Cedar Rapids, so that snow map is definitely not correct. DVN's new graphic indicates they are not going as far north as the latest euro, yet. 18z NAM through hour 39 coming in a bit North of the 12z with the Christmas Eve wave. 12z kept it all basically entirely South of the Iowa border. That's more than a bit north... a 80+ mile jump to join the euro/uk. I'd like to see this wave continue to amp and inch north a bit more. I am liking the trends of a stronger, more northward tracking system. Last night and early this morning, it looked like we might be only good for a trace to a 1/2 inch of snow in Omaha with the Saturday night/Christmas Eve system - now 2-4 inches looks like it might be possible around here. According to the NAM and Euro, our chances of a White Christmas in Omaha are certainly rising... hope these models are onto something! 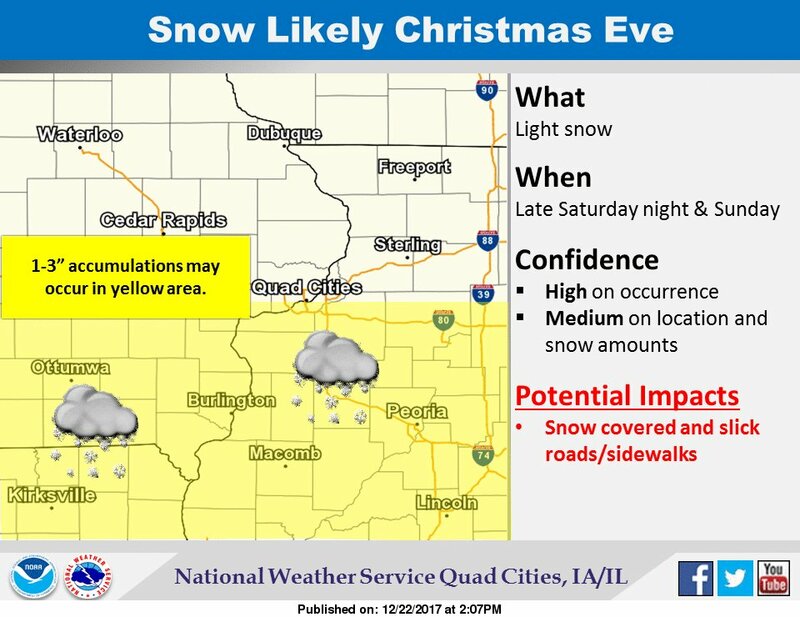 I'm just happy that it looks very likely we'll see snow on Xmas Eve. Hopefully we get at least an inch. 2 or 3" would be gravy. DVN just updated their grids to a whopping 20% chance of snow?? They are always way to slow to react to the models. DMX and DVN discussions both say best snow in the far south, but they'll watch for a continued north trend. At 15:1 or higher ratios this should fluff up nicely! In this case it will be the depth of the DGZ that will fluff it up to higher ratios. I could be wrong but just throwing it out there. GRR's warming up the WWA button..
the higher impact with holiday travel. 2". 4" bullseye is in Dodge County. Well it was nice while it lasted. This will probable trend less and less over time. It's one run of one model. It just so happens to be the lowest amount out of all the models. I think you're in a good spot. New NAM keeps snow band along the interstate. NAM is going with the southern solution. Narrow band but looks great, nice little 4" spot right in my area. I would gladly take a 1-3" band looking just like this, see what the other models have to show. RGEM also looks South so far. NWS is playing this pretty conservative. Only putting 1 to 2 inches in the area. I would think they would take it a bit more seriously considering it's Christmas weekend. Pretty strange. 4 inches is very possible with the higher snow ratios. That is very true, although the NAM really was overdone on snow totals from this last system so they may be taking that into account. Like most have mentioned ratios should be solid. OAX updated there discussion and and upped there snow totals.